I remember attending a lecture recital during my time at North Texas given by Jeff Cottrell where, among other topics, he discussed symphonic literature and recommended the use of the euphonium in place of older instruments like the ophicleide, serpent and cimbasso. I remember thinking, “Duh?! Why wouldn’t a conductor choose to substitute these outdated instruments for their technologically advanced great-grand children?” Nevertheless, I’ve rarely seen or heard of it. Euphoniumists might get a call for Holst’s The Planets, Strauss’ Ein Heldenleben or Bydlo from Ravel’s orchestration of Mussorgsky’s Pictures at an Exhibition, but it is rare to get asked to perform a part that would be better suited for the euphonium, (even though the part wasn’t explicitly scored for the euphonium). 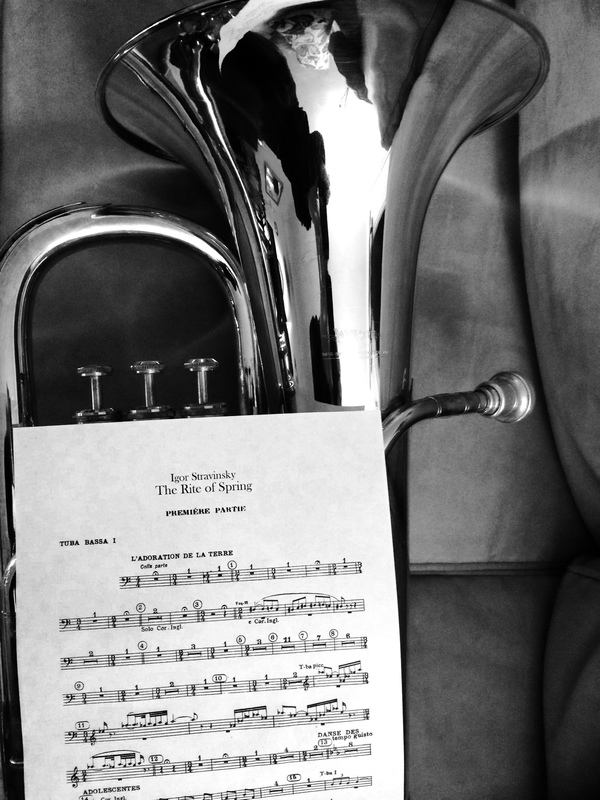 Charles Ellis, a former euphoniumist with the Army Field Band, will be conducting Stravinsky’s Rite of Spring and has requested that a euphonium double the Tuba 1 part, and play the parts designated for Tenor Tuba in the Horn VII and VIII parts. I guess it takes one to know one!! Come check out the concert…I’ll also be playing bass trumpet! I believe we pick and choose when/how we follow the composer’s intent to the nth degree — we fuss over dynamic and tempo alterations, but we alter orchestrational intent when we play these works on modern keyboards/horns and think little of it. I think that’s OK! We cannot expect the composer to know what advances would have come after their passing, but surely it is fair to assume that they would have welcomed these advances. We have evidence that Mozart played a variety of keyboards throughout his lifetime, the last of which was the most technologically advanced. That same story applies for many composers, especially in the 19th century, where we see so many technological advances in instrument manufacturing. The euphonium continues to see development and refinement today. I look at Steve Mead’s work with the Besson Prestige and its trigger-movable tuning slide, or Brian Bowman’s continued work on the Willson horn line. This instrument truly is a tenor tuba – a range the same as the tenor trombone (if not greater), with the technical dexterity of any valved instrument.